2019 Disc Golf Pro Tour Trading Cards Now Available! The 2019 Disc Golf Pro Tour Trading Cards are now available. Owning professional disc golfer trading cards is a great way to follow your favorite disc golf pros, track their stats, and learn more about them. Like with other sports trading cards, some are more sought after and will become more valuable than others. Complete Deck – The complete deck guarantees that you will receive all 65 2019 cards. 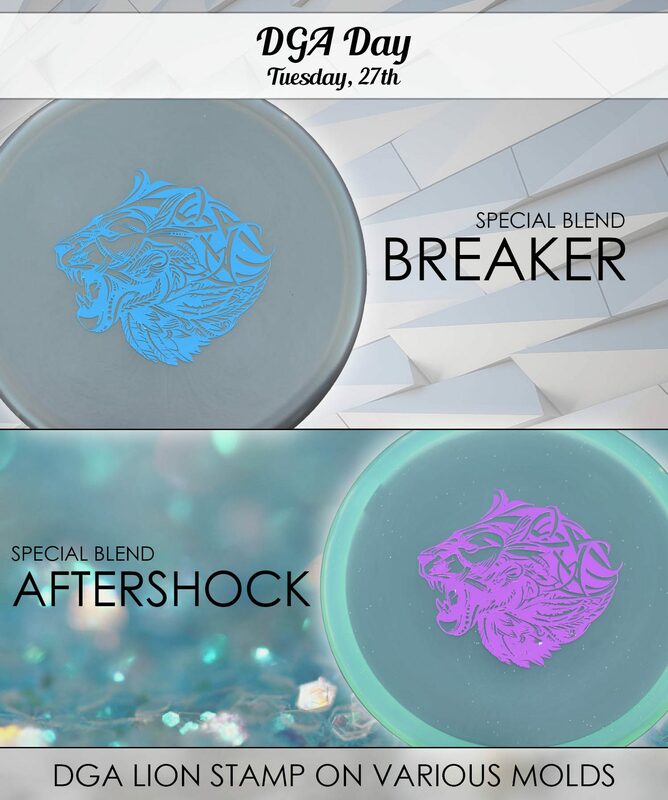 There is a limited number of complete decks available, and we sold out of all the ones we had last year very quickly. Purchase your complete deck here. Pro Tour 9 Packs – A Pro Tour Pack gives you a random selection of nine different cards. The cost is much more affordable in the 9 packs, but you don’t know which cards you will actually get which provides a of fun element of surprise and mystery each time you open a pack. Purchase a 9 Pack here. 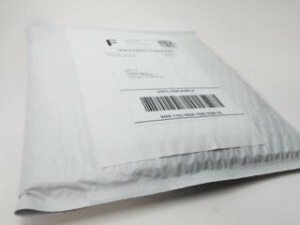 What do the 2019 packs include? There are a total of 65 different disc golf professionals that have trading cards. 50 Males and 15 Females. In addition to player cards, 1 in 5 packs also include venue cards that feature information about each of the different events of the 2018 Disc Golf Pro Tour. 1 in every 8 packs contains an “Award Card” which features awards such as Golden Putter, Sniper, Best Scrambler, Hail Mary, Rookie of the Year, Player of the Year, TD of the Year, and Staff of the Year. 1 in 12 Packs may also include a TV Card which features information about Ace’s that occurred during the Pro Tour, as well as Paul McBeth’s Historic 18 under par round. 1 in 20 packs contain one of four different rare Champion Cards. The four pro tour champions for 2018 were Paul McBeth (Points Champion), Sarah Hokom (Points Champion), Chris Dickerson (Tour Champion), and Sarah Hokum (Tour Champion). Need an excuse to play disc golf in November? Do you want free stuff for playing disc golf? After nearly two years of idling in beta status, we have finally, officially launched our Infinite Courses website and are rewarding those who help us populate it with accurate information. This post will help keep you up to date with all the latest discs that have been, or will soon be introduced in 2018. Axiom is releasing their first ultra wide rimmed drivers the Excite and Tantrum. The disc Tantrum was made available on March 23rd while the Excite will be released on April 20th. Tantrum – The Axiom Tantrum is a straight stable with a sharp end of flight fade and a 24.5cm rim. This new distance driver goes very far. Excite – The Axiom Excite is very similar to the Tantrum with a thick 24.5cm rim. The Excite is said to be slightly more understable than the Tantrum. MD5 – The Discmania MD5 is a new midrange disc coming soon! Discraft released the Vulture as part of player packs for the 2018 Memorial Challenge. The 2017 Ace Race disc has also been given a name as the Sting. These will be released to retailers sometime in the near future. Vulture – The Vulture is described as less overstable Predator with more glide. This new disc should be available soon. Sting – Discraft gives the Sting a Stability rating of 0. At our Ace Race, most players found it to be quite understable with a significant high speed turn. DGA recently had an overstable fairway driver, the Banzai PDGA approved. Dynamic Discs has at least four discs in the works. The Maverick, Getaway, and Captain will all be available in early Spring. The Patrol will initially be released as part of the Trilogy Challenge. The Dynamic Discs Maverik and Captain have a scheduled release date of March 30th. Full turn has two new drivers the Cruise and the Voyage. Gateway has already released a new midrange, the Prophecy. As always, they continue to release the popular Wizard putter in new exciting plastic blends. The Hyzerbomb Sabot is an overstable midrange very similar to the Infinite Discs Slab but with a more domey top. Well the big news for Infinite Discs in 2018 is that we’ve partnered with Innova to introduce our own disc line. 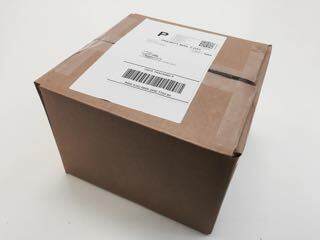 This line consists of modified existing Innova molds, expired molds, and new plastic blends. We’ve wasted no time getting our brand of discs out there and currently have eight discs released or in production. All eight of our new molds should be available by the beginning of summer. Myth – The Myth combines the elements of our top selling putters. It’s top is similar to the Discmania P2 but it has a bead on the edge of the rim which makes it more similar to the Gateway Wizard or Dynamic Discs Judge. The Myth will be available in April. Sphinx – The Sphinx is an understable fairway driver that glides for days. We had this driver manufactured specifically for beginners. This is the first disc that will be featured in our new “Infinite” I-Blend plastic. This is an affordable blend that maintains the great feel of soft star plastic but at a more affordable price. The stock run of the Sphinx will be available in April. Tomb – The Tomb is a flat top, low profile putt and approach disc. The bottom mold is very similar to the Innova Colt while the top is completely flat. This disc is surprising straight flying, but is stable enough that it is still great for forehand approach shots. The Tomb should be available in May. Slab – The Slab brings home the beef. This thing is ridiculously overstable. It is similar to Innova’s Max mold, but has an almost completely flat top. The Slab should be available in June. Anubis – This is a straight flying slightly understable midrange that is very similar to the Innova Coyote. This last disc in our new line should be available by early summer. Innova has been pretty quiet about the new releases thus far this year. At the Las Vegas Challenge they released the Rat and from their product catalog we know a disc called the Caiman is in the works. Latitude 64 has already released a driver, midrange, and putter this year. They continue to pump out lots of new molds in Sweden and there will surely be many more to come in 2017. Fuji – The Latitude 64 Fuji is the fourth double mold disc in Latitude’s line. 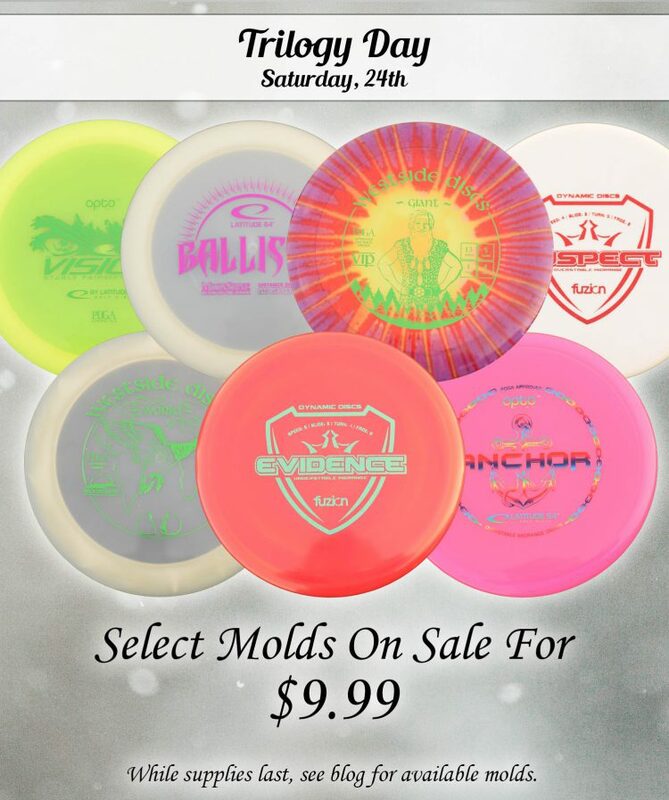 It was PDGA appproved on January 29th and became available in early spring. 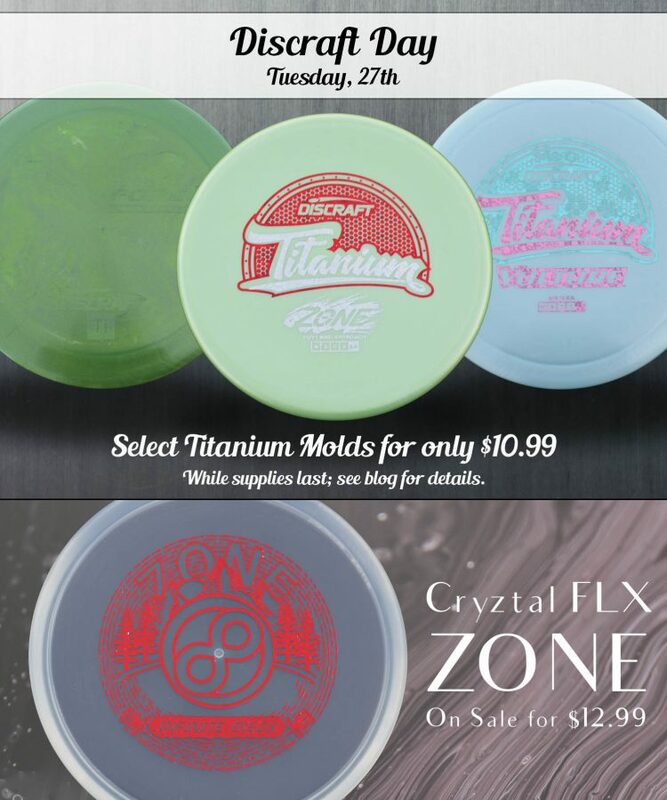 Rumor has it that Latitued will no longer be running their overmold discs, so if you like them, you may want to get a few backups now. 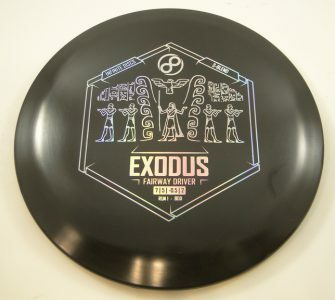 Saxon – The Saxon is a fairway driver, and according to the Dynamic Discs product catalog, was supposed to be Latitude 64’s contribution to the Trilogy Challenge. Musket – This is a fairway driver that was part of this years Trilogy Challenge. We don’t know anything else about it, but it will likely be released in Lucid plastic and will be a pretty neutral driver. The crew at Legacy discs has come up with a very overstable midrange called the Pursuit. This mid will fight the wind and always finish with a dumping fade. 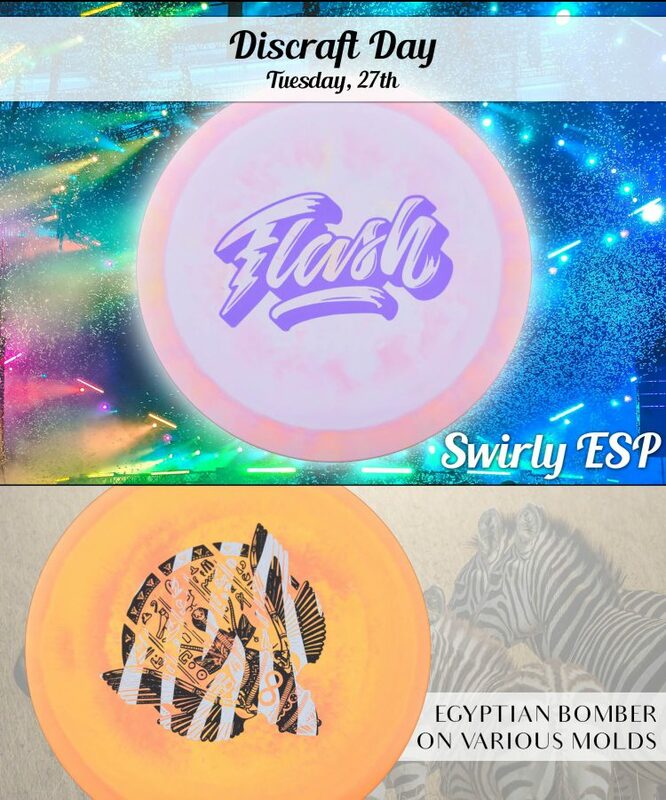 We aren’t sure when they will actually come, but Legacy has had PDGA approved too other midrange discs; the Recluse (4/3/0/4) and the Vandal (4/5/0/2). These new mids may not actually be available until 2019. Deflector – The MVP Deflector is a thin rimmed fairway driver. This is an overstable utility disc way more overstable than the Matrix, but we really don’t have any official word on this disc yet. Entropy – The MVP entropy is a disc rumored to be a very overstable putter. 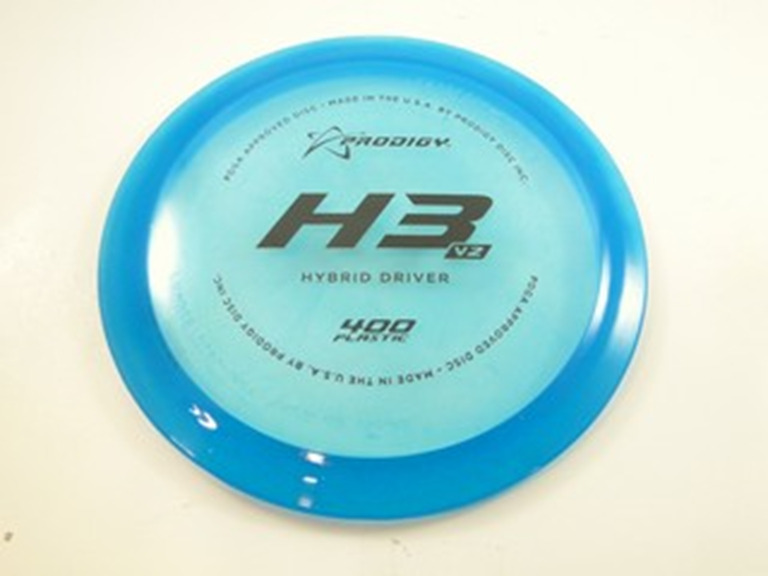 Ozone discs has a new distance driver, the Hyperion. Prodigy is releasing new versions of their “H” series discs. 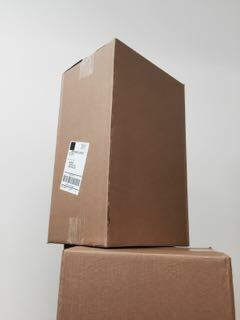 They have already released their H3 V2 which has been very popular. Unlike the last H series, this version is supposed to be more traditional discs molds with rim widths between the F series and the X series. We expect to receive the new H5, an understable hybrid driver with a moderate rim. Look for special Utah Open additions of Toothese new Prodigy molds coming soon. H1 V2 – This retooled version of the super overstable H1 has a sharper rim which provides more speed, glide, and distance. The Prodigy H1 V2 will be available March 29th. H5 – The new Prodigy H5 is supposed to be an understable easy to fly driver. Too much excitement, Streamline Discs has released two new affordable golf discs this year. Drift – The drift is a glidey straight flying fairway driver that is an excellent bag addition to players of all skill level. Runway – Streamline released the ultra overstable midrange the Runway. This disc is similar to the MVP Deflector in flight. While Vibram won’t be making any new discs, they have made the disc golf news by declaring that they will cease disc golf operations in 2018. If you’re a Vibram fan, let not your heart be troubled as we still have a healthy stock of all the most popular Vibram molds and will be getting a large shipment from their last run. Yikun has a new midrange the Kui, a Distance Driver the Lu, and a new triple mold disc the “Twin Swords”. It looks like Yikun is taking a new approach to try and actually do something new. 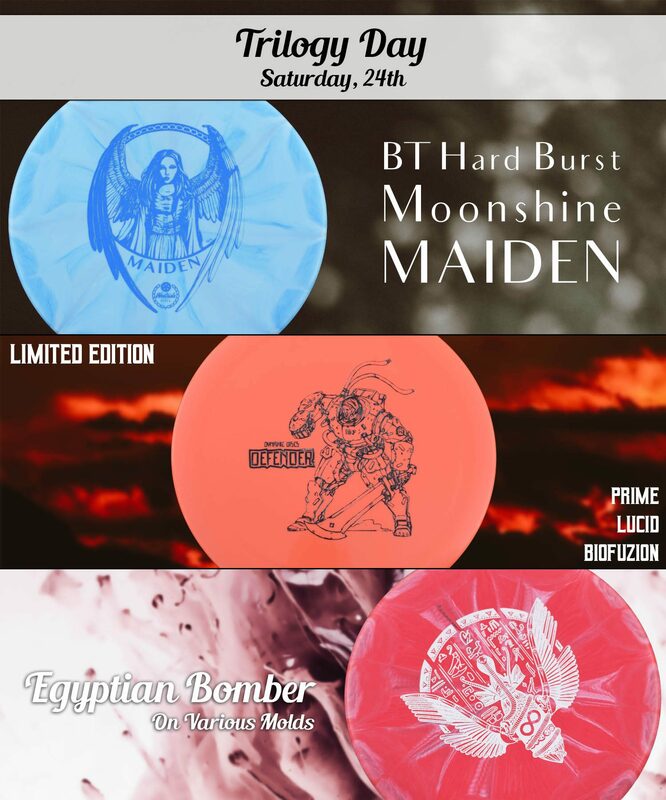 Do you know of other new discs that aren’t yet included in this post? Please let us know about them in the comment section below and we will add them to our list. discussed on the golf course. That would be the subject of stretching before a round of disc golf. of golfers stretch and how often they stretch. 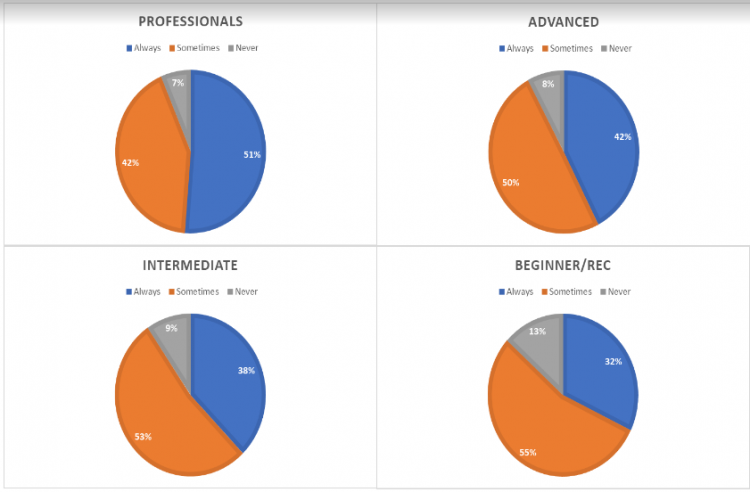 each skill level and how often they stretch. 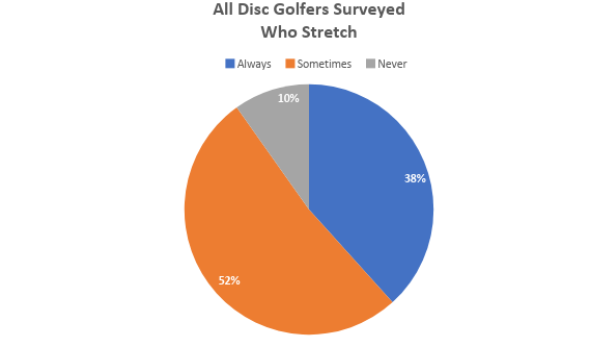 Of note for those who marked professional disc golfer, 51% stated they always stretch before a round. player you are, the more likely you are to always stretch before playing disc golf. I don’t see any harm in taking a few minutes to stretch before a round if there’s a chance to improve. channel where you can see exactly how to do specific disc golf stretches.